The Mexican electronic permission FMM for 180 days must be obtained priour to buying a ticket to Mexico. However, it now has the fields "flight number" and "airline name" as required ones. I don't have a ticket yet and I read recommendations that for Mexico I must frist apply for FMM and then, after I've gotten it, buy a ticket. And I did this last time. The last time there were no "flight number" and "airline name"
How can I get it then? What to fill out the fields with? You don't need to get an FMM before booking tickets. If you're flying, you don't need to visit that web site at all. The current procedure is that you will be given the FMM form during the flight to fill out before landing in Mexico. You will pay the fee to the airline as part of your ticket price (IATA code UK on your ticket receipt). You show the FMM at immigration when you enter Mexico, then keep it and turn it in when you check in for your flight departing Mexico. You can also purchase the FMM in advance from the gob.mx web site, as you have discovered. In this case you will have already paid for it. The web site will give you the FMM that you must print, show to immigration, and turn in when you leave Mexico. If you're flying you shouldn't do this, since you have already paid the FMM fee via the airline. Buying the FMM in advance is advisable when you enter Mexico by road, as you may find it difficult to get it at some border crossings. If you are from Russia or another country from which Mexico requires visa for tourists (Spanish), and you don't meet one of the exceptions, then you'll need a visa or SAE before you travel to Mexico as a tourist. See the link above to see if you qualify for an exception, for example, if you have a valid US or Schengen visa. Citizens of Russia, Turkey or Ukraine can get an SAE online instead of getting a visa. This is not the same as an FMM. You still get the FMM on the plane or when you arrive in Mexico. (Citizens of other countries who don't need a visa will also get the FMM on the plane or when they arrive, and the FMM fee is usually included in the airfare.) But you need the visa or SAE before you travel. Here is the Mexican embassy in Russia's website about how to get SAE (Russian) (Spanish). It also confirms that you will complete the FMM when you arrive in Mexico. Not the answer you're looking for? 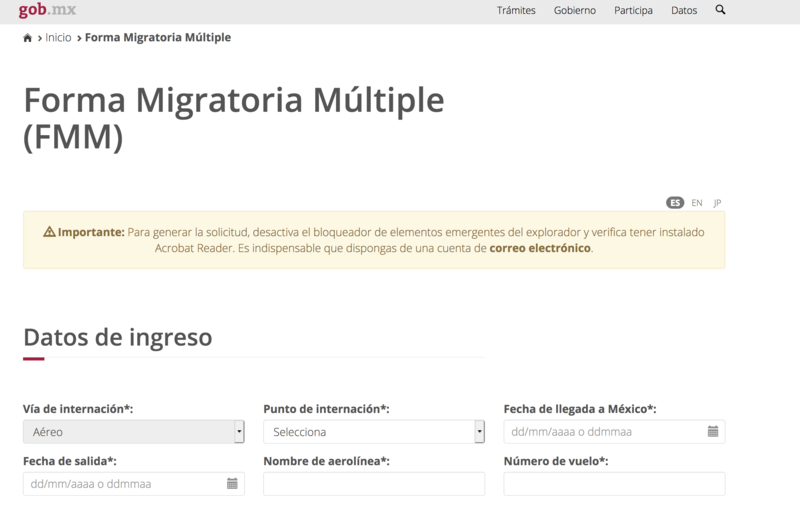 Browse other questions tagged mexico entry-permit fmm-tourist-card or ask your own question. Are there still any “cheap” options for flying from Australia to Mexico without going through the US? German entering USA from Mexico after loss of passport? Entered the US by land, left by Mexican land border. Had a flight booked but didn't take it. Will I have problems entering the US again? Do dual American and Mexican citizens need passports to travel between the US and Mexico? When a person gets a Mexican FMM online, when do they do the background check?